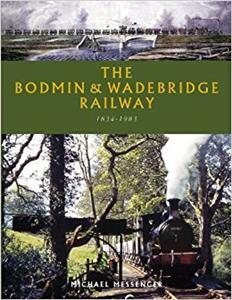 Planned and opened before the Victorian era, the Bodmin & Wadebridge Railway was one of Britain’s earliest public railways. Pioneering the use of steam power it was built to serve local agriculture but later Cornwall’s mineral wealth became its mainstay, ensuring its survival for almost a century and a half. Despite falling into the hands of the London & South Western Railway early in its life, it was not physically connected to their system for over fifty years, and so remained an isolated local railway with a character all of its own. Ambitious extension plans failed to materialise, although the important connection with the Great Western Railway did. For many years the line was home to some of the oldest working steam engines on Britain’s railways, running through the gorgeous scenery of the Camel Valley, and now the route survives as part of the popular Camel Trail. An incredible amount of original documentation of the railway survives, scattered in archives across the country, and the author has brought this together to tell a detailed, intimate account of a small Cornish railway; how it worked, how it failed and how it succeeded. And also to dispel some of the myths and tales that have grown up. The story is told of the people involved, and of the communities and industries the railway served.